Donna Ann Lass. Click to enlarge photograph. Donna Ann Lass (25), born November 3rd 1944 in Sioux Falls, South Dakota, disappeared from Stateline, Nevada on September 6th 1970, having finished her shift that day at the Sahara Tahoe Hotel, (now the Hard Rock Hotel and Casino). where she was employed as a nurse. A few months earlier in June she had moved to South Lake Tahoe from San Francisco, where she had previously worked as a nurse at the Letterman General Hospital in the Presidio, near the Paul Stine murder scene. She was scheduled to work her night shift at the Sahara Tahoe Hotel from 6.00 pm to 2.00 am, but was logged out at 1.45 am that morning for the last time. Sometime following, an unknown man, who could possibly have been the abductor contacted her employers, along with her landlord stating that Donna Ann Lass had been called out of town due to a family illness, all of which proved to be fiction and ​the young 25 year old woman was never heard from again. The Paradice Motel, 953 Park Avenue, South Lake Tahoe. Click to visit website. ​Harvey Hines (see right), a law officer who retired from the California Police Department in 1992 had an avid interest in the Donna Lass case and remained resolute in his determination to solve her disappearance, forming close associations with the Lass family members. Along with Mary and Don Pilker, the sister and nephew of Donna Lass, they became convinced the Zodiac Killer was responsible for the abduction in South Lake Tahoe, in addition to his crimes in the north Bay Area. Harvey Hines interviewed by the Tahoe Daily Tribune stated, "There was a lot of evidence inside Sahara Tahoe Casino that she left directly from there. She was a very personal person and she left a lot of personal items behind; an opened letter, a dirty uniform and on her log, a pen was dragged from the last word she wrote to the bottom of the page". Sierra Club stone cross. Click to enlarge photograph. ​Donna Lass had recently moved into the Monte Verdi apartments on 3893 Pioneer Trail Road (street view), located just a three minute drive from the Sahara Tahoe Hotel and Casino. When she first arrived in South Lake Tahoe in June she stayed with Ann and Larry Lowe at 4054 US Highway 50 and was just finding her feet in the new residence when she went missing. Although her 1968 Chevrolet Camaro convertible was discovered outside the Monte Verdi apartment complex in its usual parking spot, it is believed she had not driven it to work on the evening of her disappearance, having walked to work from this previous residence, which was a short walking distance to the Sahara Tahoe Hotel of approximately 8-10 minutes. She had made plans to meet up with her friend Jo Anne Goettsche, intending to travel back to the Monte Verdi apartments in her vehicle, once her shift at the casino had finished. ​Harvey Hines is firmly of the conviction that Donna Lass was abducted from work, and there is a high probability that this is actually what happened. Donna Lass was a conscientious worker, described as very reliable. This allied to the dragged pen mark from her nurses log, seemed to suggest she was either physically assaulted here, or more likely lured from her work station on the ruse of an emergency in the car park, where she was likely abducted. The last person apparently to see Donna Lass before her disappearance was a Joan Bentley from San Francisco, who stated that Donna appeared in good spirits at approximately 1.40 am. The last entry on her log according to Mary Pilker was "patient complains of", before the pen trailed off. Despite this, many observers speculate that Donna Lass arrived at her Monte Verdi apartment complex in her car, where her abductor lay in wait close by, or possibly she was trailed from her workplace to the apartment complex. The phone call informing people of Donna Lass' family illness is telling. The caller was not boasting of murder like the Zodiac Killer exhibited after the Blue Rock Springs and Lake Berryessa attacks, he was seemingly trying to give the impression nothing sinister had happened, suggesting the act of the phone call was simply to 'buy time'. If the abductor was affording himself some extra breathing space, then the real possibility he was local to the area or known to Donna Lass is a credible argument, and he was either holding Donna Lass at this juncture, needed time to dispose of her body, or possibly needed to remove incriminating evidence from his home or vehicle before the police came knocking. This could have suggested that the responsible moved in the circle of Donna Lass, such as friends and work colleagues, who are inevitably the first people to be questioned in most police investigations. ​If Donna Lass had walked to work that evening from a previous residence, her car had obviously never been parked outside the casino that night. If the perpetrator knew Donna Lass and the vehicle she drove, then a phone call to the casino, implying she had been called out of town for a family emergency and would be away from work for a period, would be negated if her Chevrolet Camaro convertible was spotted sitting idle in the car park of the casino for any extended period. This may indicate the perpetrator knew her vehicle was parked outside the Monte Verdi Apartments, where it was less likely to attract attention, but needed to allay any concerns the landlord may have concerning rent collection. The fact that Donna Lass' abduction coincided with her shift change is also telling, indicating that the crime may have been planned in advance, as she vanished moments after changing from her nurses uniform into regular clothes. Was the killer close enough to Donna Lass to know her family lived in Beresford, South Dakota and the phone call had a better chance of buying extra time under these circumstances. The person or persons who made the phone calls stated that Donna Lass had been 'called away' or 'called out of town' on account of a family illness, indicating the caller was aware her family did not live in South Lake Tahoe. Although not impossible, this information or knowledge is not something to be expected from a random killer. Sioux Falls, South Dakota is 1,555 miles from Lake Tahoe, which would in theory buy the perpetrator a reasonable amount of breathing space to complete his objective. The San Francisco Chronicle ran an article on the missing Donna Lass on September 26th 1970 entitled 'Nurse Vanishes...A Tahoe Mystery.' 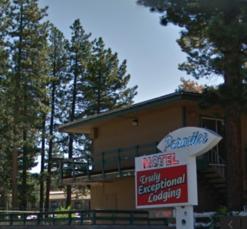 It may have suggested the phone calls had the desired effect, stating "As the absence lengthened hotel, officials contacted the South Lake Tahoe Police, who checked her apartment and could find no clue to her whereabouts. Relatives in Sioux Falls flew here a week ago." So I suppose Zodiac's paraphrasing of the Mikado on July 26th 1970 stating "none of them will be missed". partly rang true, in the sense it bought him valuable time. 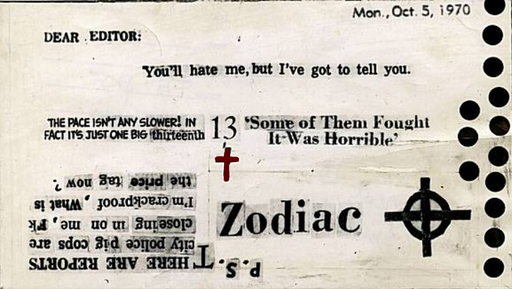 If the author of the Pines postcard, mailed to the San Francisco Chronicle six and a half months later, was the Zodiac Killer, then it opens the door on him being resident to the area at the time of Donna Lass' disappearance or having been connected to her in some way. The counter argument is that the Pines Card, similar in vein to the 13 Hole Postcard, was designed by the real murderer (not Zodiac) of Donna Lass to deflect attention away from the South Lake Tahoe region, towards the killer of five in the Bay Area of Northern California. Sheriff's Inspector Stanley Parsons stated "If the Zodiac claims he killed the missing nurse at Lake Tahoe, and if in fact he did slay her, then there is a very good chance he also killed Miss Hakari and Miss Bennalack". Judith Hakari had been working at the Sutter Hospital in Sacramento on March 7th 1970, and later had pulled into the parking lot of the Markston Apartments, where she was likely abducted. One and a half months later she was discovered in a shallow grave- she had been beaten and strangled, but not sexually assaulted. Shortly after the disappearance of Donna Lass, and two days prior to the 'Halloween' card, on October 25th 1970, Nancy Bennallack, a court reporter, was found murdered, brutally stabbed numerous times at the Talutian Apartments just one block away from the Markston Apartments. This, if indeed the Zodiac Killer, would suggest a marked deviation from his previous crimes. (see video on right). For more information on the Judith Hakari and Nancy Bennallack murders, please visit here: The Quester Files. Donna's Chevrolet Camaro convertible was found locked outside her Monte Verdi apartments on 3893 Pioneer Trail Road. Her flat showed no signs of disturbance or any suggestion that a violent struggle had occurred. In addition, no suspicious activity subsequent to September 6th had been noted on her credit card or savings account. On September 6th 1970 Jo Anne Goettsche, a former roommate and work colleague of Donna Lass at the Letterman General Hospital in San Francisco, mentioned above, had planned to visit her friend at the Lake Tahoe Casino and spend Labor Day weekend with her, however, with Donna Lass nowhere to be found after her shift, her friend returned back to San Francisco Sunday evening none the wiser, and from here on in the mystery deepened. The fact that Donna Lass had planned to meet her friend inside the casino suggests that Donna Lass, having already changed from her nurses uniform, had likely been tricked into leaving the building on 'medical' grounds, as her last log entry would testify. Could this indicate that more than one person was involved in her abduction and disappearance. There is a further interesting aspect to her 'abduction' from the casino, that of the timing, of 1.45 am, just before her shift end. As stated earlier, if the assailant knew her vehicle was at her Monte Verdi Apartments, and was known to Donna Lass, then why didn't the assailant just wait until she exited the building, rather than entering it, incurring greater risk. Was the perpetrator aware of her plans to meet Jo Anne Goettsche just after 2.00 am, so acted just before the end of her shift. The subsequent phone call may then have served an extra purpose of allaying the worries of Jo Anne Goettsche, had she informed the casino of her concerns or contacted the police. If the perpetrator knew of Donna Lass' arrangement with her friend, he may very well have spoken to her in the preceding days, further cementing the idea he was known to the young woman. 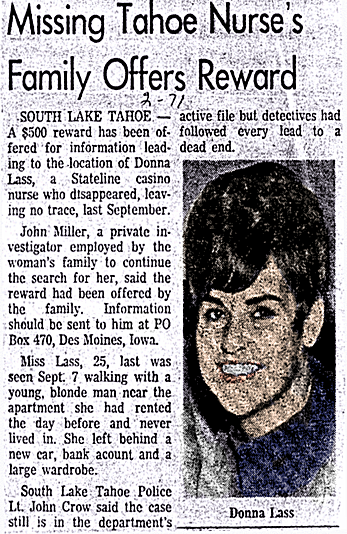 Although the date is incorrect in the article top right of page, it states that "Donna Lass was last seen walking with a young blonde man near the apartment she had rented the day before". This man was never identified. ​On April 20th 1970, a letter was mailed to the San Francisco Chronicle, containing a cipher of only 13 characters, widely known as, the 'My Name Is...Letter'. Harvey Hines believed he had decoded it to reveal the name of proposed Zodiac suspect Lawrence Kane, closely aligned to the missing woman, on the grounds he worked at the same South Lake Tahoe Casino as Donna Lass. In fact he worked for Alan Dorfman selling Arizona real estate and his office was located just down the hallway from Donna Lass' work station. Harvey Hines drew further parallels to his suspect, citing the similar writing styles of the Zodiac and Lawrence Kane. To view a video of Harvey Hines and his proposed solution to the 13 Symbol Cipher (My Name is Letter), click the banner link top right of this page. Kathleen Johns. Click to enlarge photograph. Kathleen Johns and her 10-month-old daughter Jennifer were abducted on Highway 132, near Modesto on March 22nd 1970, that became known as the Modesto Attack. This is a crime that sits on the edge of the Zodiac Killer story, with many enthusiasts feeling it has received unwarranted attention on such flimsy evidence, that basically relies on two key focal points. Firstly, the identification of her abductor from a composite drawing at the Patterson Police Station, in connection to the Paul Stine murder at Presidio Heights on October 11th 1969. And secondly, the Zodiac Killer himself claiming to be responsible for the abduction four months later in a mailed letter to the San Francisco Chronicle on July 24th 1970. Kathleen Johns was lured into the abductor's car on a ruse that the wheel of her car was coming loose, ultimately offering her a lift to the nearest service station. He would, however, take her on a two hour mystery tour through the outskirts of Tracy, California, before she managed to escape across a field clutching her infant child. According to Harvey Hines, Kathleen Johns in the 1980's would review her ordeal that night, pinpointing Larry Kane as her likely abductor. Pines Card mailed on March 22nd 1971. Click to enlarge. Also Pam Huckaby, the sister of Darlene Ferrin, who tragically died at Blue Rock Springs Park on July 4th 1969, stated that Lawrence Kane had been trailing her sister in the run up to that fateful night at the Blue Rock Springs parking lot. Unfortunately her recollections and suspicions have changed many times throughout the years, having now placed her faith in Lyndon Lafferty's claim that William Grant was the Zodiac Killer. The Pines Card, 3.22.71, was mailed six and a half months after the disappearance of Donna Lass, falling on the first anniversary of the Modesto abduction of Kathleen Johns. The authenticity of this postcard as a Zodiac communication has divided the community ever since. It contained five phrases pasted onto a postcard, but their meaning has yet to be fully determined. It was addressed personally to Paul Avery, a reporter at the San Francisco Chronicle. ​To view the original undoctored Pines Card advertisement, click here. 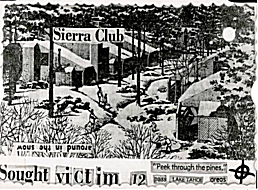 The text on the card read;  'Sierra Club'  'Sought Victim 12'  'Peek through the pines'  'pass Lake Tahoe areas'  'around in the snow' (pasted upside down). Pines Card address side. Click to enlarge. 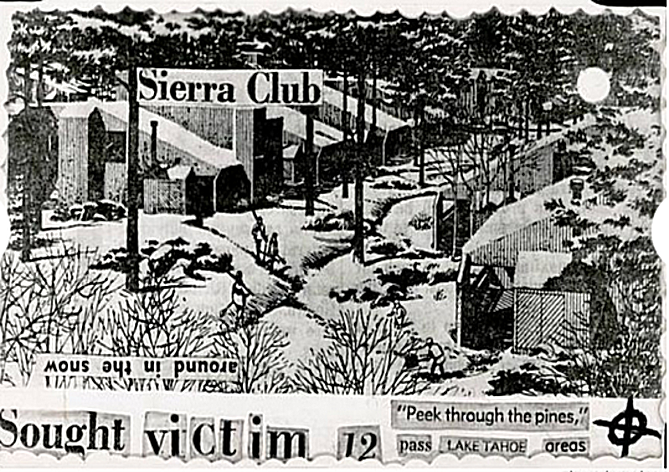 The Pines card never made any direct reference to the missing Donna Lass, only insinuated a connection through the 'Lake Tahoe' and 'Sierra Club' references. If Donna Lass was murdered by the Zodiac Killer, then the Pines Card may hold a cryptic message, although it may be simply just another blind alley and another cruel hoax. 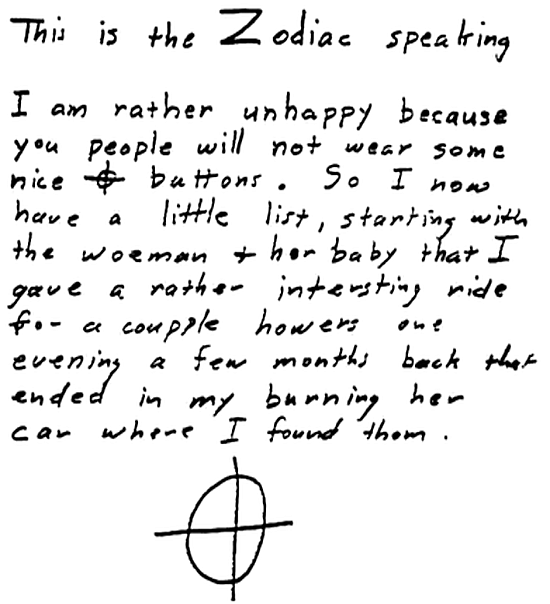 The June 26th 1970 'Button' letter and Phillips 66 map, as well as the July 26th 1970 'Little List' letter, were withheld from publication by the San Francisco Chronicle to generate a reaction from the Zodiac Killer and possibly force him into a mistake. ​A San Francisco Chronicle article on June 30th 1970 detailed the 'Button' letter, stating that Zodiac was now boasting 12 victims, but withheld the images and code contained within the correspondence. The Zodiac Killer certainly did not appreciate anything less than 'front page' coverage.. However he did not bite on this occasion. ​On October 12th 1970 the San Francisco Chronicle finally relented and published the 'Little List' letter, along the '13 Hole' postcard, which was mailed on October 5th 1970, a week earlier. These communications displayed the Zodiac victim count at 13. Then the Halloween Card on October 27th 1970 raised the Zodiac total to 14, before his March 13th 1971 'Los Angeles' letter claiming 17+ victims. ​The question therefore, is why did his 'Pines Card' on March 22nd 1971 display 'sought victim 12'. Even if we return to the date Donna Lass went missing on September 6th 1970, he had already claimed 12 and 13 in two previous letters. Does this indicate a hoaxer, and pour scorn on the 'Pines Card' as genuine Zodiac material, or is there a rational explanation for this apparent retrograde step. Despite little in the way of handwriting on the postcard, Questioned Documents Examiner Sherwood Morrill determined that the postcard was authentic Zodiac material. He was confident of recognizing Zodiac's handwriting, stating "I've got him down cold. If he were standing beside me, say, in a bank, filing out a deposit slip, I know I'd recognize that printing anywhere. Basically I identity handwriting, inks, typing, erasures, obliterations, alterations, even the paper itself. Handwriting is as individual as fingerprints. With sufficient samples of a person's handwriting or in Zodiac's case, printing - I can tell if he wrote the document in question". 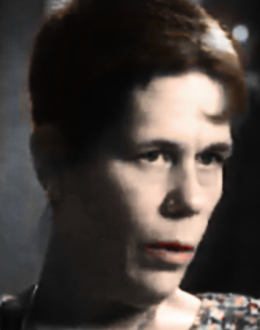 The two immediate communications after the Donna Lass disappearance were both mailed to the San Francisco Chronicle. As stated above, the first was the 13 Hole Postcard on October 5th 1970, and the second was the Halloween Card, on October 27th 1970, which addressed Paul Avery by name. The search for Donna Lass would be badly affected by the inclement weather in the coming months, highlighted by Police Chief Ray Lauritzen from the outset: "We don't know where we're going to begin. There's a four or five foot pack of snow out there and it's still snowing heavily". The Pines Card made reference to the snow, but in a sinister way, by pasting the words 'around in the snow' at ground level and upside down, the author may be insinuating that Donna Lass was buried under it. A newspaper article stated that 'the site depicted on the 'Pines Card' was from an advertisement published last Sunday by several newspapers. 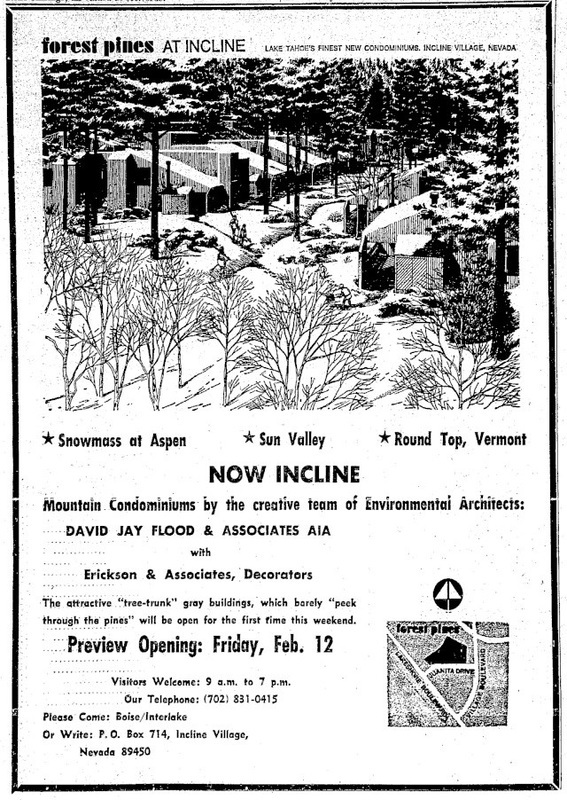 It was an artist's rendition of houses among the trees at a Boise Cascade Company project at Incline Village, where construction has just begun on the development. While much of the Sierra area is under several feet of snow, Incline Village has only two feet on the ground. Police went to the area to determine if a search is possible'. ​Chief Lauritzen added "There's no point to a search at this time. It's unlikely a victim would be uncovered before spring". The following is an excerpt from the unreleased 120 page Harvey Hines report, regarding his investigation into the missing Donna Lass. The following pictures show a unique image of the Pines Card created by Harvey Hines and a photograph of the crucifix stone formation at the Sierra Club. "After studying the card, I drove to Nordin, located on old Highway 40, north of Lake Tahoe, and found the SIERRA CLUB. I learned the club was not called the Sierra Club. It was named the Claire Tappan Lodge and it was a private club for Sierra Club members only. I believed if I followed the directions on the postcard I would find Donna Lass' grave. I believe she was buried near the Sierra Club and most likely on the Donner Ski Ranch. I would later have the pictures of the Sierra Club developed. Then using a copy of Zodiac's card, I cut out the phrases he had pasted on his card. Using these phrases, I overpasted them on the copy of the Sierra Club picture. It was striking similar to the original card". 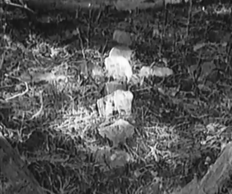 Harvey Hines believed the punch-hole in the top right corner of the Pines Card may have indicated a burial site or at least revealed key information to the disappearance of Donna Lass. An area near Clair Tappaan Lodge, Norden, California, on Sierra Club groundsi was identified, where a rock configuration of 13 stones were positioned in the form of a cross. This area had initially been discovered by Otto Fredericks while out hiking in 1976 and revealed to Hines several years later. Harvey Hines informed Zodiac expert Dave Peterson, and an excavation the site was undertaken, but no remains were found. Lawrence Kane, Hines' main suspect was questioned by police but through lack of evidence no case could be brought against him. In the August of 2000 the South Shore law agencies were presented with an 80 page report from Harvey Hines. Detective Tom O' Conner reviewed the issues it raised and although not in total agreement with its findings, it nevertheless generated enough to spike his interest. The South Lake detective took blood samples from Lass' sister Mary Pilker and using identity cards once owned by Donna Lass, created a record of DNA, to cross match any present unidentified remains or ones discovered in the future. Detective Conner said "There is the possibility that her remains have already been found and entered into the data bank." He went on to add "If we get a match at least we'll know where she was found. Hopefully that would be some kind of closure for the family." ​The family of Donna Lass have become disillusioned with certain aspects of the case, "I haven't heard from anyone," Mary Pilker said. "It is quite a disappointment. Conner seems to be doing as much as he can and he seems to be doing it all on his own time." Mary Pilker is convinced the Harvey Hines Hines report is the key to solving Donna's case. Harvey Hines "What I've wanted to do for a long time is hand my case over to some agency and let them run with it. I don't care if I don't get a dime's worth of credit as long as someone closes it out." View the Hines Report at Zodiackiller.com. Monte Verdi Apartments, 3893 Pioneer Trail. Click to view on Google Maps. Donna's nurses uniform was discovered in her office and her car found was outside her residence at the Monte Verdi apartments on Pioneer Trail Road. These apartments are only 0.4 miles from the Paradice Motel. 1974 Christmas Card envelope. Mrs Mary Pilker, Sioux Falls, South Dakota. December 27th 1974 Christmas card. Click to enlarge. 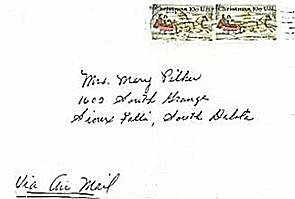 On December 27th 1974, a Christmas card was mailed to Mary Pilker, Donna Lass' sister, portraying trees covered in snow. 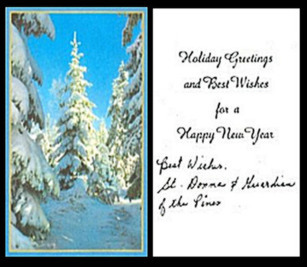 Once opened it revealed a message that was part of the card itself - 'Holiday Greetings and Best Wishes for a Happy New Year', followed by the handwriting "Best Wishes, St Donna & Guardian of the Pines"
An in depth analysis of the Pines Card sent to the San Francisco Chronicle on March 22nd 1971, the concept behind the random wording on the card, its connection to the disappearance of Donna Lass on September 6th 1970 and its possible links to the 13 Symbol Cipher, sent to the San Francisco Chronicle on April 20th 1970. Clifton Calvez, a retired Air Force colonel thought he knew where the body of Donna Lass may be found, employing the unusual approach of satellite imagery, before venturing to the area to put his theory to the test. He entered the Lake Tahoe region via Highway 89, however due to a fire in the region was abruptly halted at Emerald Bay, so proceeded another way around the lake to eventually arrive at his predetermined destination of Antelope Way, when he received that eureka moment. Placing a line through Antelope Way to the Rubicon Peaks summit, it bisected the trees [peek through the pines]. When he progressed into the woods, he found two trees had been carved into. One depicted a baboon, the other a satyr. He took photographs of the area where he believed Donna Lass' burial site could possibly be located, although after a thorough excavation of the site no remains were found. A second location was identified, but again he came up empty handed. Nevertheless he is still of the opinion that the body of Donna Lass is located somewhere in this region and remains optimistic of a resolution some day.